1807 General Simon Perkins, commissioner of the Ohio Canal Fund, enthusiastic promoter of the Western Reserve and involved in planning the canal across the Summit and down the river to Lake Erie, has acquired land in the area of the Portage Summit. 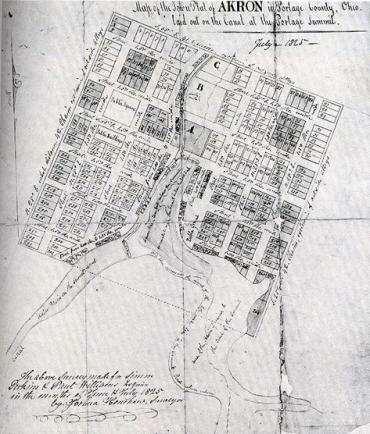 1811 Paul Williams, who has settled near the corner of Buchtel and Broadway, suggests Perkins and company plat a town along the strategic point of this canal and donate lands for the right-of-way. 1825 Akron (later known as South Akron) becomes a town. In December of 1825, the completed town plat is recorded in Ravenna, the county seat of Portage County. (NOTE: The Akron area was originally a part of Portage County.) The name "Akron" was derived from a Greek work meaning "high" since the Portage Summit was the highest point on the Ohio & Erie Canal. 1832 The Ohio & Erie Canal opens, joining the Cuyahoga and Ohio rivers. 1833 The Village of Cascade (later known as North Akron) is founded. North and South Akron are separated by a strip of land called "The Gore." 1834 Akron's first school is built, then replaced in 1840 by the Old Stone School, still standing at Broadway and Buchtel Avenue. 1836 North and South Akron incorporate into Akron – population 1,343. On March 12, 1836, Akron receives a city charter from the state. Seth Iredell is elected first mayor of Akron by defeating Eliakim Crosby 91-75. 1840 Summit County (so called because it lay along the Portage Summit) is formed from portions of Portage, Medina, and Stark counties. Akron is named as the county seat. 1844 Abolitionist John Brown moves to Akron.